Are you aware that according to statistics there are around four (4) million deaf people in the Philippines alone? And only around one hundred cast their votes during the last election? I hope the government supports them in their quest for public Video Relay Service (VRS) to be provided in public areas. NOT everyone is aware of the plight of our comrades in the deaf community. I believe that our brothers and sisters who are deaf should have equal chances with everyone and a public Video Relay Service (VRS) will help them a lot. Do you have Php 150 to spare? I am knocking on your heart please. Yes, I am calling on everyone, please support a carnival-themed fundraising event for the deaf come May 12, 2012 entitled Visual Music Carnival (VMC). It will be an exciting event packed with fun-filled activities and performances bundled together with the most awesome rock bands in the Philippine music industry. Ms. Bernadette Herrera and her Bagong Henerasyon campaign support this event. This is a truly remarkable endeavor for our hearing and speaking impaired friends. This charity event will help the Telecommunication Service Network for the Deaf (TSND) Inc., to raise funds to buy at least 5 (five) units of Video Relay Service (VRS) that will help deaf people here in the Philippines. The Visual Music Carnival is a celebration of music, visual arts and extreme sports with a direct cause. It is a fundraising event aimed to provide support to the projects of the Telecommunication Service Network for the Deaf (TSND) Incorporated. Part of the goal is to support the TSND’s public VRS station installation project in communities with a high volume of hearing impaired residents. This will be held annually in venues such as stadiums or fields upon which the stages and other structures are erected. Video Relay Service is an internet powered service that helps deaf people call anywhere and anytime hassle free. A VRS booth comes with a V-Pad. A V-pad is a touch screen videophone with a camera; it will be bolted in to a wall just like public pay phones. Where in there will be a sign language interpreter on standby during service hours. To simplify, it’s a videophone with a built-in interpreter that will make the calls for the deaf caller. 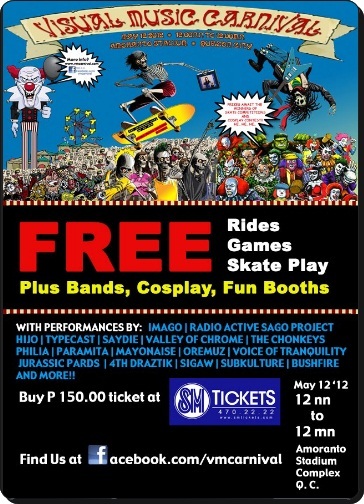 Tickets are being distributed through SM Tickets and can be purchased for only PHP150 with tons of freebies such as rides, game tokens and skate plays. Activities such as jumpers, outdoor rides and carnival games and other thrilling activities, mind blowing games, band performance, battle of the bands, photo booths, skateboard exhibition demonstrations, playgrounds, cosplay competition.